To know me is to know I love hydrangeas. But for the last few years, my hydrangeas have not bloomed because the first year my husband let a “landscaper” prune my hydrangeas (I actually cried) at the wrong time of year and the other years spring frosts killed the buds. So every year, I cross my fingers and promise the universe that I’ll be a (relatively) good girl if my hydrangeas finally bloom. So far, my pleas have fallen on deaf ears so I’m taking matters into my own hands and I’m planting Endless Summer® Hydrangeas. These babies bloom on old and new wood which means that even if mother nature wreaks havoc with spring frosts, they should still bloom. 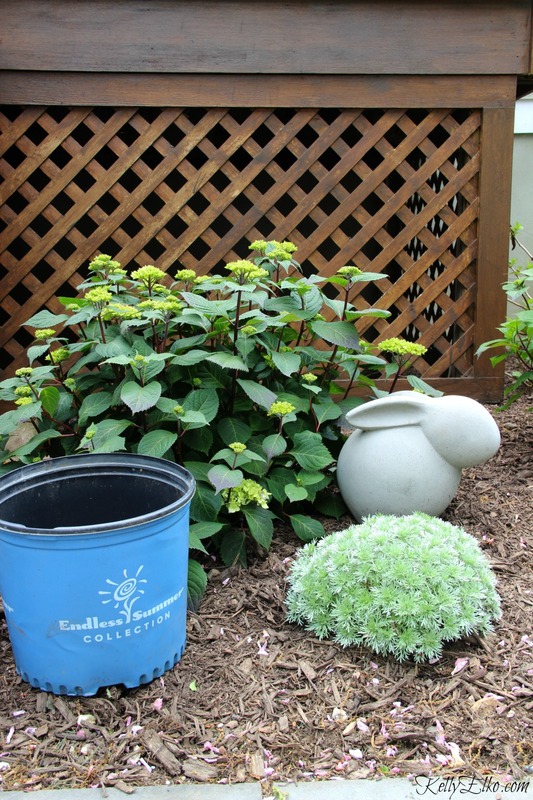 Just look for the hydrangeas in the bright blue pots! Endless Summer® Hydrangeas come in four varieties and I fell in love with BloomStruck® and can’t wait for them to give me tons of gorgeous blooms. What sets these hydrangeas apart is that they rebloom from spring through fall unlike other hydrangeas that only bloom once or twice (or sometimes never in my case)! My family enters and exits through our back door so we walk by this little garden bed right next to our back deck many times a day. It was in desperate need of some color and personality. Here is the before and after (I removed a sad lilac that wasn’t looking good). Don’t be afraid to move things around your garden if they aren’t performing well. No guesswork since everything you need to know about planting your new hydrangea is right on the tag. Morning sun and afternoon partial shade is best but the farther south you live, the less sun these plants can handle. Dig a hole as deep as the pot and about 1 1/2 the width of the pot. If roots are tightly packed, loosen them with your fingers. Add a slow release fertilizer to the hole. Place hydrangea in hole making sure the place where the stem meets the top of the dirt is even with the ground (not above or below). Add quality planting mix around the plant and pack tightly. 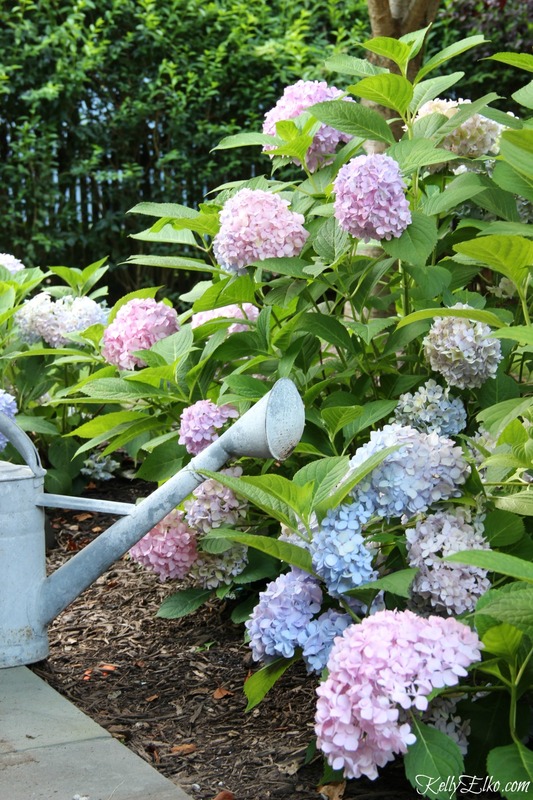 Hydra means water and your hydrangeas need it so make sure to do this every day especially during intense summer heat. You may notice your blooms wilt in the afternoon sun but they should spring back once it cools down. Although these hydrangeas bloom on both old and new wood, it’s best to prune in the fall to ensure you get the maximum amount of blooms. 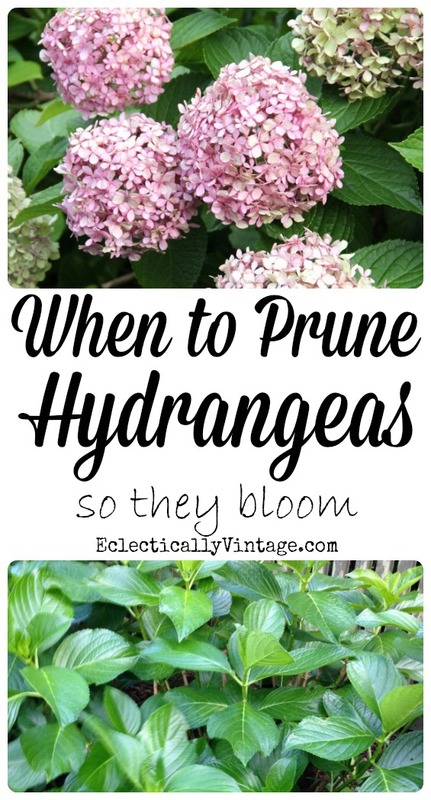 Read my tips on When to Prune Hydrangeas here. Why should the garden beds get all the fun? I decided to try something new and added another Bloomstruck® Hydrangea to a pot on my patio. Make sure to use good potting soil and add a slow release fertilizer when planting. A few trailing flowers add interest and I love adding something unexpected like this seashell to my pots. The flowers are just beginning to blossom giving me a hint at the color that awaits. 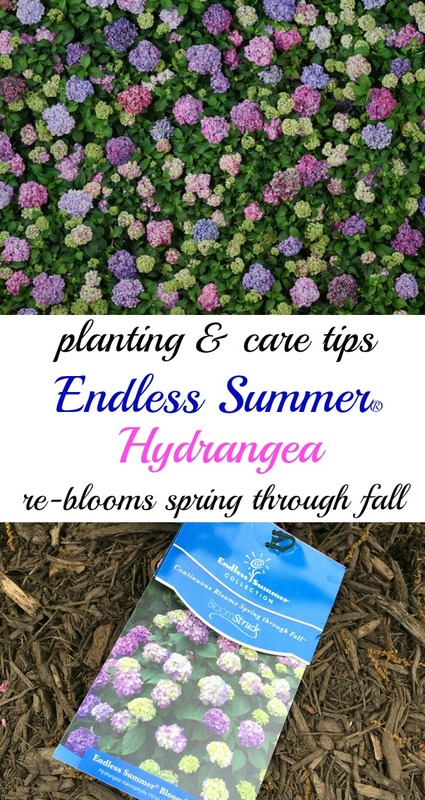 I get tons of questions about hydrangea care and I love that you can take the guesswork out of how to care for your Endless Summer® Hydrangeas by texting ENDLESSSUMMER to 73095. They will send care tips throughout the season (don’t worry, they won’t use your info for marketing purposes). If you need me, I’ll be on my patio enjoying my new plants and an ice cold margarita. so beautiful, and i kinda want to belt out richard marx endless summer nights when i see them. The Endless Summer Hydrangeas are beautiful! I am hoping my son and husband will give me some for Mother’s Day. Maybe you should forward this to them as a subtle hint!! Happy Mother’s Day Lisa! I love them too but have never grown them in my yard. We get a lot of deer so I wonder how they would be around here. Enjoy your weekend! Have you tried human hair clippings around the base of the hydrangea or moth balls inside pantyhose and hung inside the plant? Sounds weird but you may want to give it a try and if you do let me know how it works! We have an urban deer population too and they’ve eaten my Holly bushes, Hostas, Tulips, and more, but they never touched my Hydrangea. That is good to know and you have the politest deer in the world! Oh landscapers – you need to stay far away from our hydrangeas! I planted some endless summer hydrangeas this year. I can’t wait for them to bloom! I can’t wait either and then I can’t wait to clip some and bring them inside! Have you tried moving them? Morning sun is better than the blaring afternoon heat. Hydrangeas are my favorite summer bloom too!!! I absolutely LOVE the idea of planting one in a pot and I think I’m going to give that a try this summer. We have several bushes planted in the front of our home, but I’d love to plant some in the backyard. I just need to find a type that enjoys getting all-day sunshine. Thank you for sharing this information. 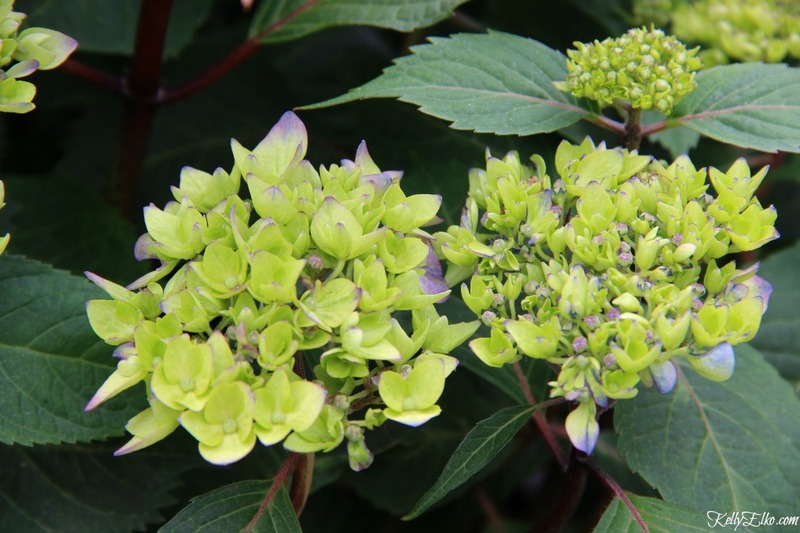 I have been looking for a hydrangea that could provide lots of blooms and not require a lot of care! Very helpful post. My pleasure Sandi and enjoy them! Oh my gosh I HAVE to get some of these!! Thanks for the post. They are awesome – I’ll show them when they’re in full bloom! I’m having a new flower bed installed next week with 3 hydrangea bushes. I’ll make sure to ask for the endless summer collection. Thanks for the post!! How exciting Betsy and enjoy them! I think I am going to do the same thing, my hydrangeas have not bloomed in 3 years so out they go! I am also going to try the Endless Summer variety! Endless Summer is a great name for a line of robust plants! Hydrangeas are definitely one of my summer favorites and I especially love the arrangement you made in the pot :). Thanks Leslie – I can’t wait until they fully bloom! Love the idea of a hydrangea in a barrel on the deck. Might have to do this! So happy you posted this! When we moved to our new home I purchased 5 of the endless Summer hydrangeas … it was the best move on my part. They truly do bloom all summer and have tripled in size over the last several years . I prefer a blue flower as opposed to the pink, and use a special fertilizer that changes their color. They are magical and bring me the most joy of anything in my garden . My favorite flower of all time ? That’s amazing Avey – I can’t wait to see how mine grow over the years! 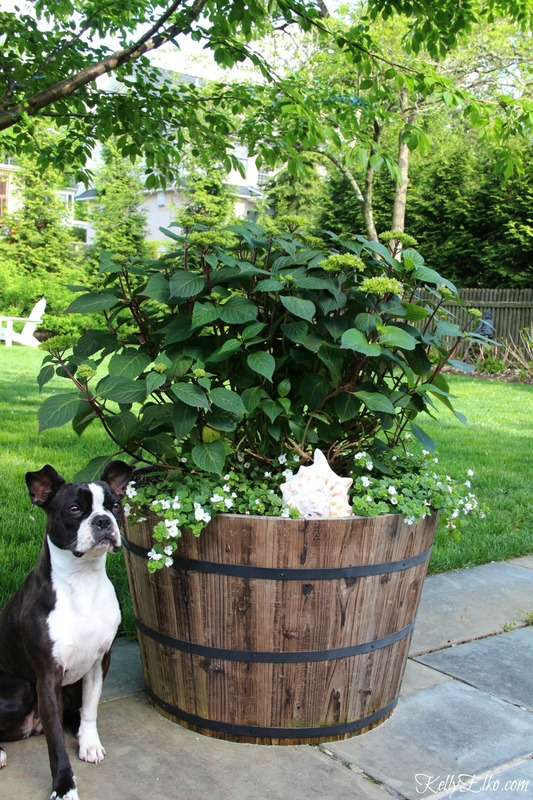 Love the idea of a hydrangea on the deck in a barrel. I think I will do this! It’s such a nice change from typical annuals Sally! Beautiful Endless Summer hydrangeas. We’ve already had a 108 degree day here in Phoenix this month. So, needless to say my favorite flower in the world will not survive here. Try as I might, it’s just not going to happen. I will enjoy yours vicariously. I love Hydrangeas and we just moved 1 year ago to a house across the street from our old house. I am starting over on a property with no Hydrangeas but my daughter just gave me one for Mothers Day! (I had 13 at my house across the street) I would love to be entered into your contest! I love hydrangeas as well. I have had good luck with the Lace Cap and also the Endless Summer. The Lace Cap can grow very large…so beware. But they are delightful and always bring a smile to my face. Good luck this year. Looks like u are off to a good start. Thanks Barb – I have tons of hydrangeas but the cold springs have made them not bloom for years so I’m glad to get blooms from these! Hydrangeas are one of my loves too. I would love to fill my yard with them, but it gets too hot. I don’t have and Endless Bloomer. Would love to try one (or lots). I hope it works out for you Mary! They look pretty right now, i think. It’s always fun to watch flowers open up a little at a time. Thanks Kelly and Happy Mothers Day to you. The happiest of Mother’s Days to you too Marlene! They look beautiful! I love your yard with all your vintage finds! 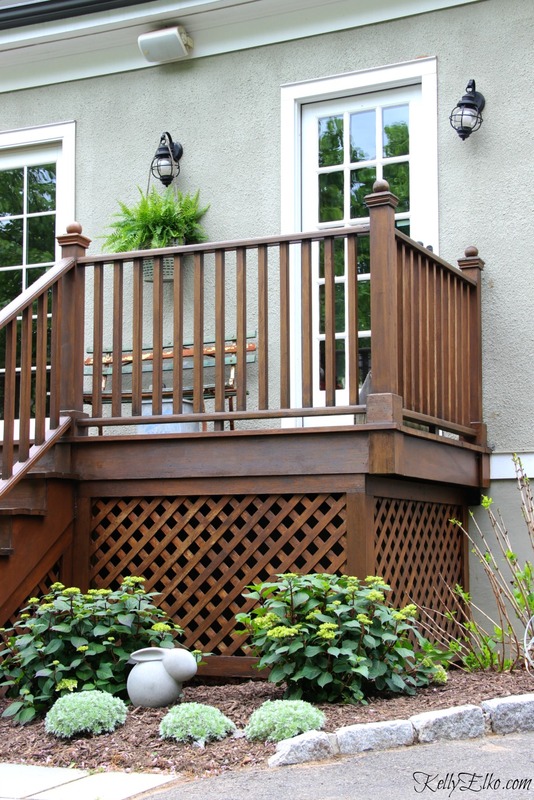 I can’t wait to see more of your yard this summer! I looked forever to find an Igloo cooler. I’m so excited to have in my yard this summer. ? I love my igloo – it’s holding wood for the fire pit now! Just in time for Mother’s Day. Simply wonderfully made. I am crossing my fingers that my hydrangeas bloom this year, too! I’ll cross mine for you too! Ooh I will have to try these! Wow! I’m going to have to check these out for my area! I have had the same problem with my hydrangeas! I haven’t seen blooms in years! Thanks for the info! Good luck Maureen – we all deserve hydrangeas! I also love hydrangeas and have not had a lot of luck with mine. I just planted endless summer next to my house! I’m hoping they do well in my acidic soil (as that’s their preference). I planted an endless summer bush a couple years ago and it hasn’t failed me (yet) so i feel your happiness..i love it..
Where can I buy the endless summer hydrangea? I do love Hydrangeas but never much success in hot Texas climate. Do they come in different colors? And where can they be bought? Oh my ! Hydrangeas are one I have always loved but have never owned! A friend of mine used to change their flower color by fertilizing them. I would LOVE, LOVE, LOVE to win them!! Love plants that bloom all through the spring and summer. Oh i must find. How big do they get?. And can they be found at lowes? Yes, Lowe’s sells them and these get around 4-5 feet wide x 3-4 feet high. 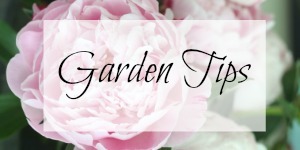 But I’ve a question for you…I’ve read of putting coffee grounds around the base of my plants but I don’t know how much and should I mix them with something else and how often. One site on internet says they are acidic,another says alkaline. Can you give me an experienced opinion? I’ve never used coffee grounds Marilyn so I can’t offer any tips on that. I too love hydrangeas! Hope these that I planted do well. I just bought two blushing bride Endless Summer hydrangeas. Reading your post was timely. Can’t wait to see how they do. I did sign up for the text alerts too! Fingers crossed for tons of blooms! Hi Donna – you won the Endless Summer Hydrangea giveaway (garden gloves and garden tool set/tote)! Please email me at [email protected] with your full name and address so I can make sure the company ships your prize! I would love to try these! I’ve never been able to get mine to bloom! These are so beautiful!!! Love the hydrangeas and am going to try them myself. 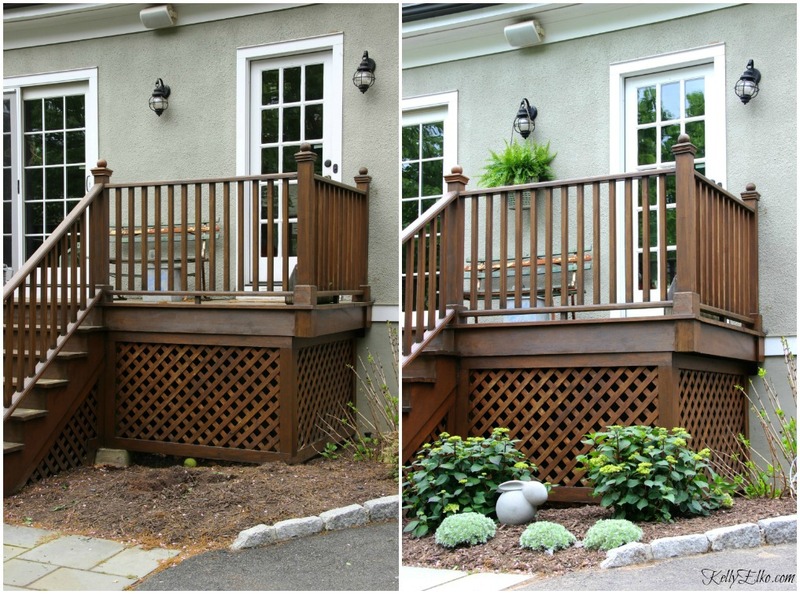 I also love the color of deck stain in the pictures shown. Would you mind sharing the type and color you used. I am preparing to stain our deck and pergola. I would very much appreciate your help. Loved my Endless Summer for several years, then they stopped blooming. Don’t know what to do to get them to bloom again. Beautiful! Because I rent, I would plant in containers. I do this to so I can move around. I have 2 Endless summer hydrageas. The first year was great and since then, no blooms. They are healthy and growing, but last year there were no blooms and this year it looks bloom less again. I water and feed regularly and I want my beautiful blooms. I never prune severely. What’ my problem? So sad. Those are beautiful! I’d love to win one! I’ve never heard of that kind before! 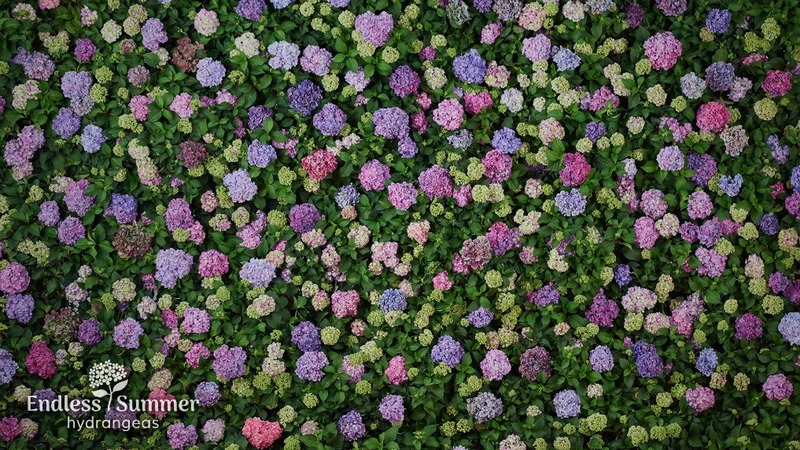 Where can you buy the endless hydrangeas? Love hydrangea! I have several but no rebloomers! Would love to have some! I love hydrangeas, so I will look for this in the blue planter. I have not seen these before but would love to have a longer blooming season. Pretty neat. These are very beautiful. I have never heard of this type. You have provided some good tips. I’m going to try this. Just planted can’t wait for the glorious blooms. Mine are starting to burst with color Penny – can’t wait until the whole thing is in bloom! Thank you.love those flowers.I will be planning me some.beautiful. What kind of plant are the 3 light green plants in front of the hydrangeas. I just purchased the endless hydrangea. I am so excited for it to bloom!. What would make me ecstatic would be it would bloom a Boston terrier like yours!? Sushi is flattered and sends kisses! These are beautiful. I am going to try planting in my back yard as the sun isn’t as hard there. I live in Alabama and our summers can be brutal. I have had many of the same problems you have had with getting my hydrangeas to bloom! I have several and added two Bloomstruck one last year and one the year before. So I am anxiously waiting to see what they will do this year! Thanks for the tips! Very helpful? Hope you get tons of blooms Peggy! My husband tok the clippers to my hydrangea too. I’m hoping they bloom this year. I enjoyed your post. i just signed up for the text tips!! I had our front landscaping re-done last year, and they planted 3 Endless Summer Hydrangeas – but I’m afraid it’s not a good spot for them, and I’m really disappointed (in the landscaper, not the plants). I’m in St. Louis, and I don’t see a single bloom yet this year, and I’m pretty sure mine get too much afternoon sun, especially in the heart of the summer! I’m going to try to get out to a nursery this weekend to talk to them and get some fertilizer. They prefer morning sun and dappled afternoon shade – full afternoon sun is probably way too strong. We have lived in our home for 10 years and I have yet to find the right blooms for my flower bed out front that would make my neighbors pause and admire. How do you know if you have a reblooming one that has been planted in your yard for 10 years? I was actually very glad to come across this post this morning. I have tried for over 10 years to have success with hydrangeas. 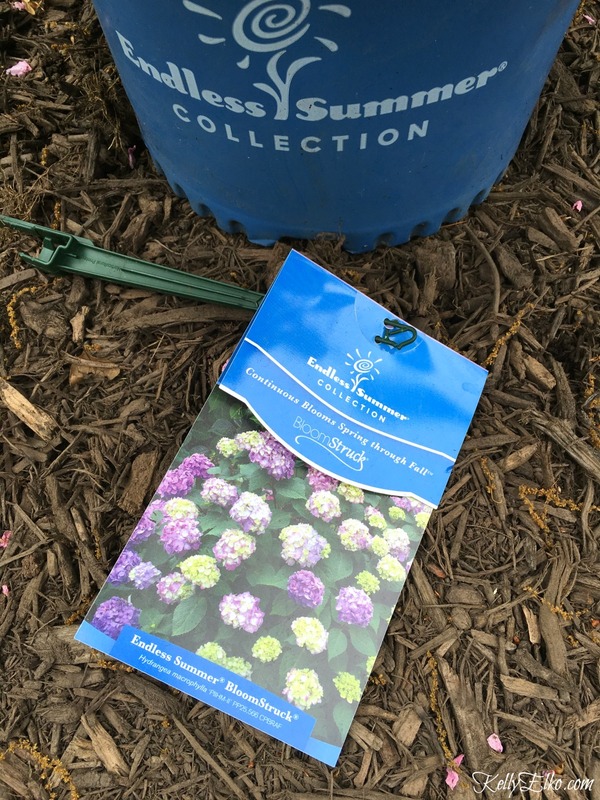 I bought a set of the inless summers hydrangeas this year-and was glad to be able to read how to take care of them so hopefully this year I will get the most out of my blooms. My husband just passed away with stage 4 cancer and I have not been able to do garden work for years. Hopefully he is up above watching over and helping me to take care of these. Oh I’m so sorry Kim – my dad had stage 4 cancer too and passed away a little over 2 years ago. Maybe they are both looking down on us together praying we get blooms! This happened to our hydrangeas as well. I have been waiting to see if anything came from the ugly old wood but it doesn’t look like. Is there a way to cover them up to protect them this winter so this doesn’t happen again? I don’t have any Endless Summer but am definitely interested in a long blooming hydrangeas. Sorry this happened Christine. There are ways to try and protect them – cover them with leaves but if the bushes are huge, it’s going to take alot of leaves! The most important thing is to protect them once they’ve got buds on them. Mainly that means you worry about late frosts. Any time there is a late frost in the forecast, I put old blankets and towels on my hydrangeas. Looks silly but it works. So glad to hep Eileen! Hi Kelly, I just have to tell you that you’re Boston Terrier is so stinkin’ cute!!! I love my Endless Summer Hydrangea plant, but I loved my Boston Terrier even more. Lost him over 40 years ago, but fond memories remain. Enjoy your summer and thanks for your information. I love Hydrangeas!! I work for Easy to Grow Bulbs and I am usually the first in line when they come in. I seem to water them way to much as most novice gardeners do lol. I totally am going to look for these. Just dont tell the boss lol. Kelly I don’t know if I have endless bloom or not but my plants are blooming. What’s the deal with cutting a few for the house ? I try to just take a couple that are near the bottom or otherwise on the fringe of the plant. Will they only come back if I have endless bloom? 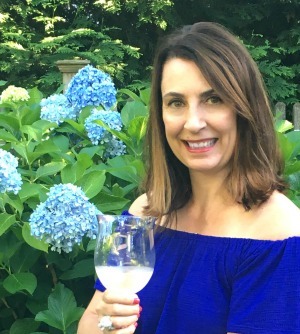 Jeanne – I cut my hydrangeas during the summer to bring inside. Just make sure not to cut too much of the branch (slightly longer than you want your stems) and cut above a leaf node. Make sure you cut only the flowers that are fully bloomed (once cut, they won’t continue to bloom). Enjoy them! HI Kelly your hydrangea look beautiful, I had one that did not flower last year and got this fertilizer called holly tone from Walmart, you put it in the soil around your plant only in the spring and fall. This year all my hydrangeas bloomed and now I get pink and blue flowers, before using the holly tone I would only get pink flowers. You may already know about this fertilizer, but just thought I would share. Thanks Becky – I use Hollytone and love it! Glad you got your blue flowers! I just bought an endless hydrangea. Wish me luck. My new home has a hydranga that needs to be moved. When is the best time to do it. What special care etc does it need after the move.